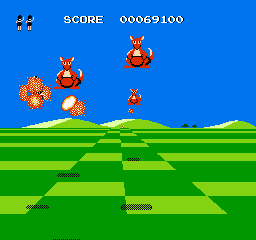 This game’s a Space Harrier clone. 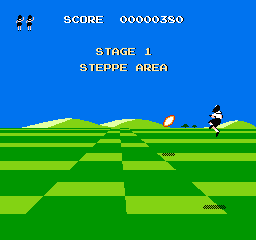 It’s not a -bad- Space Harrier clone, but it’s not a particularly good one either. The music is kinda catchy, the graphics are decent - especially the fact that your little heroine character will change outfits if the level you’re playing warrants it, which is quite a nice touch - but the fact of the matter is that she moves just a liiiiiittle too slowly, you can only fire two or three shots at a time, and the screen is usually filled with so much stuff that it’s almost impossible to survive. 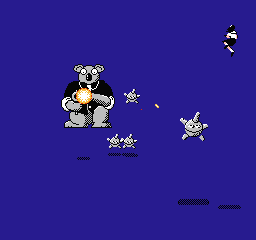 I beat the game by savestating through it, but that gigantic panda-thing with the huge eyes and submachinegun still gives me nightmares… okay, maybe not, but still! I’m going to say, “Try it, you might like it! And if you don’t, it builds character.” and leave this review at that. 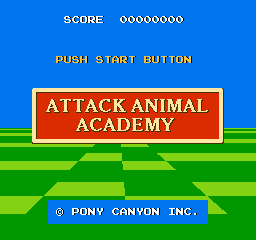 This patch translates the title screen. Not that there was anything else that needed it, but it does a good job of what it does!